Tabitha Lipkin is only 24, but she already has a more colorful resume than most people twice her age. 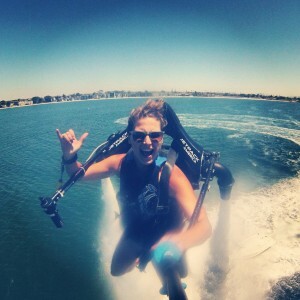 Lipkin, BJ ’12, Life Member, is a San Diego-based TV reporter and jetpack pilot who now holds the inimitable title of Scuba Queen International. 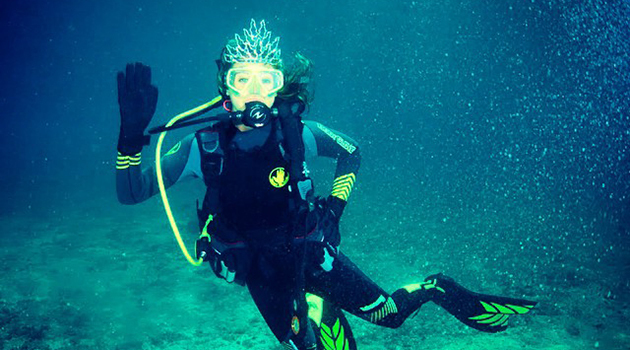 She traveled to Malaysia earlier this month for the International Scuba Pageant—yes, you read that right—where she beat out 13 other scuba-diving women from around the globe. Lipkin spoke with the Alcalde about her eclectic career, why she’s passionate about marine conservation, and her dream job. You have some unusual jobs. I love my job as a reporter because I love spending time with people and sharing their stories. I love being a jetpack instructor because I like to share that experience and see the look on someone’s face when they fly a jetpack; it’s incredibly rewarding. And scuba-diving is so exciting. You feel like a real explorer when you’re under the water. What is a scuba pageant like? The first week in Malaysia, they judged us on our ability to dive and our knowledge of marine conservation. The second week was more of the beauty pageant side of things. We visited a special needs school and went to some cultural heritage sites. We also went to dinners with different politicians and we did some catwalk training to make sure we were prepared to prance around in our gowns! How did you end up in this pageant? I knew the girl who went before me to represent the United States. I’ve been diving since 2010 and I actually learned to dive when I took a course at the University of Texas. They’ve since discontinued the program. I did have some hesitations, just because I am not a beauty pageant girl, but I thought it would be exciting and a new adventure for me and kind of unexplored territory. I figured there was nothing holding me back because I also got sponsored by Body Glove, which is a really big scuba-diving company. Tell me about your jetpack work. I teach people how to fly the type of jetpack that goes on your back. When I was at UT, I saw a promo video about the jetpack, so I reached out to the inventor and eventually flew out to Florida to meet him and saw the factory in which they were producing them. We kept in touch and then after starting my career in broadcast journalism, it’s been a great release. It takes my mind off of what can sometimes be a really intense job. What are your duties as Scuba Queen? I get to travel the world speaking about marine conservation. I think a big focus will be saying no to shark fin [soup], as well as sea turtle poaching, global warming, and pollution. In January I go to Paris and Dusseldorf, Germany, which is apparently one of the biggest scuba trade shows in the world. My dream job is to have my own travel show, like Anthony Bourdain meets marine conservation. 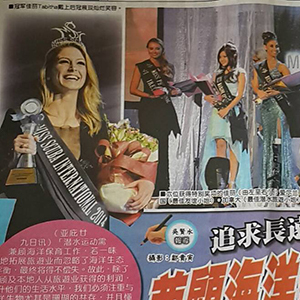 Photos from top: Lipkin diving with her pageant crown; on the front page of a Malaysian newspaper; and during a jetpack flight (personal photos).